The clients requirement was to measure and monitor the temperature and flow in hotel water supply systems. This is a requirement for modern hotels to prevent the growth of legionaries bacteria in pipes where the water has not moved sufficiently and the temperature remains at a favorable temp for the bacteria to grow. By being able to log this data, the hotel can show that such conditions have not occurred in the pipes. 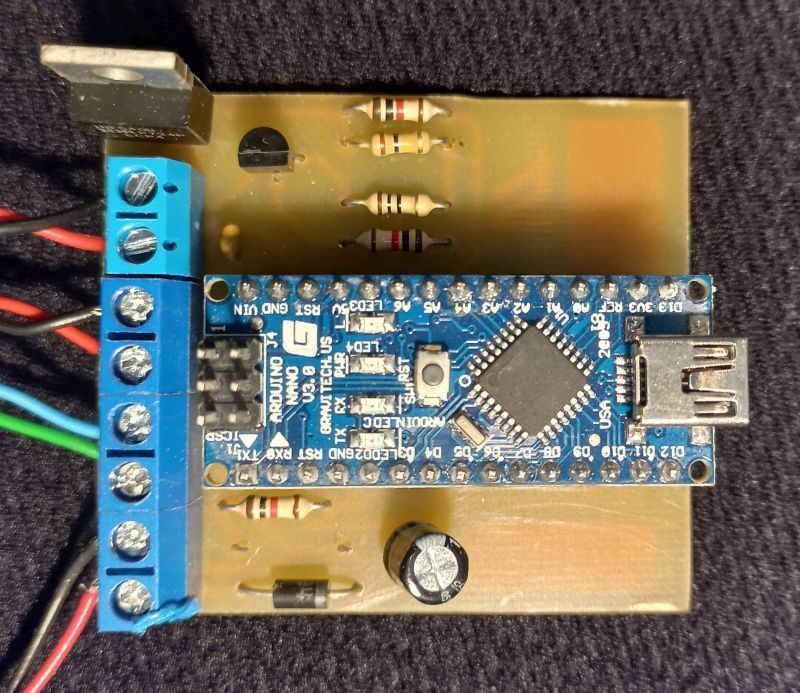 A versatile Arduino Mega based controller for treadmills. It reads a pre-set profile from an SD card and controls the motor speed. It has a auto and a manual mode. In the manual mode speed and duration can be set, whereas in auto mode the speed and duration change according to the saved file on the SD card. The SD card profile program can be written on any text editor. The patients ID is entered and after the exercise is completed it sends an SMS with all the details to a franchisee. The unit is able to be generically used in many other applications. Many SMS based functions are available to read the available call time and change address book numbers etc. The LCD displays the current speed and time left to run. 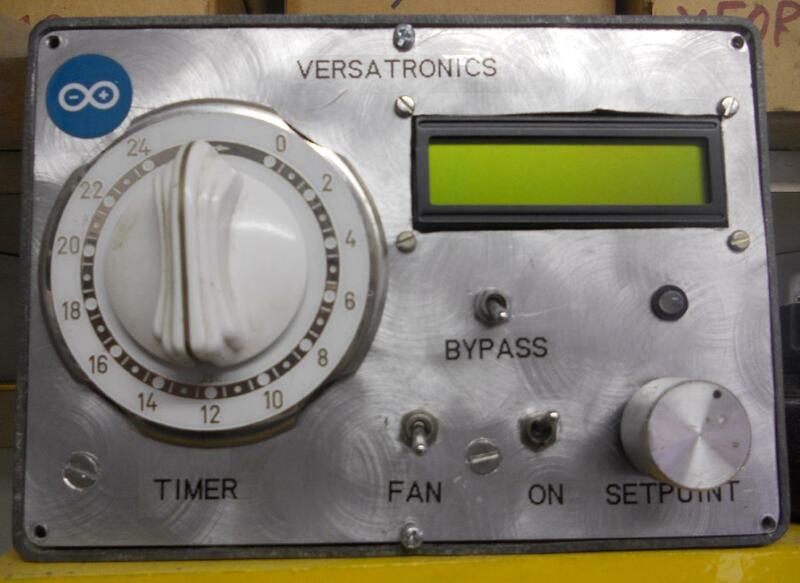 Versatronics specializes in Arduino based projects. We have used Uno, Mega, Teensy, and Leonardo. We also make our own versions of the Uno for special applications where greater output currents or relay interfaces are required. 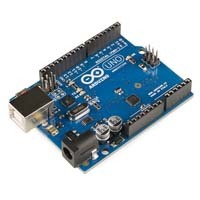 Complex Arduino software projects have required over 2000 lines of code. 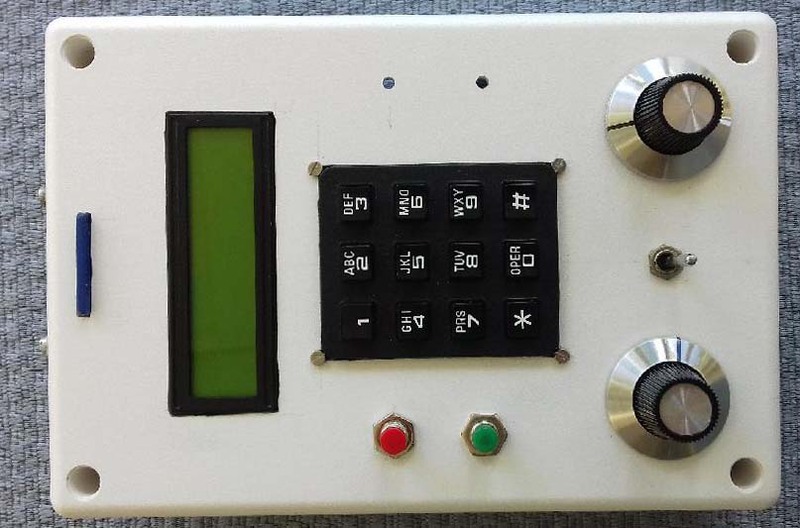 Some of the interface applications have included GSM, WiFi, Internet, Cell phone, Mains power, Sound to light, Infra red controllers, Servo motors, Stepper motors, Robotics, Quadrature sine-wave generators, SD card loggers, SPI LED animations etc. A Bass Compressor is a guitar effects unit designed to compress the peaks in the attack produced by a bass guitar without distortion. This gives a "thicker" sound at the same volume level, enabling the bass to keep a steady level without being lost in the clutter or being over loud. 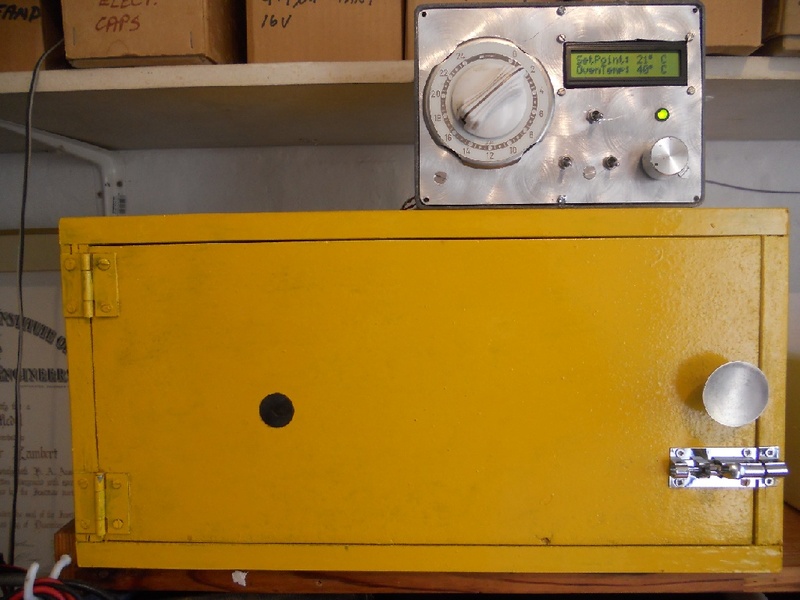 This product was developed to control the temperature and relative humidity inside a chicken egg incubator. In addition to doing this, it periodically rotates the egg tray as well. It has 2 triac mains controlled outputs and 2 relay outputs and analog and digital inputs, making it suitable for many other controller applications as well. It uses a Atmega 328 (Arduino) chip and has it's own on-board PSU making it very useful indeed. 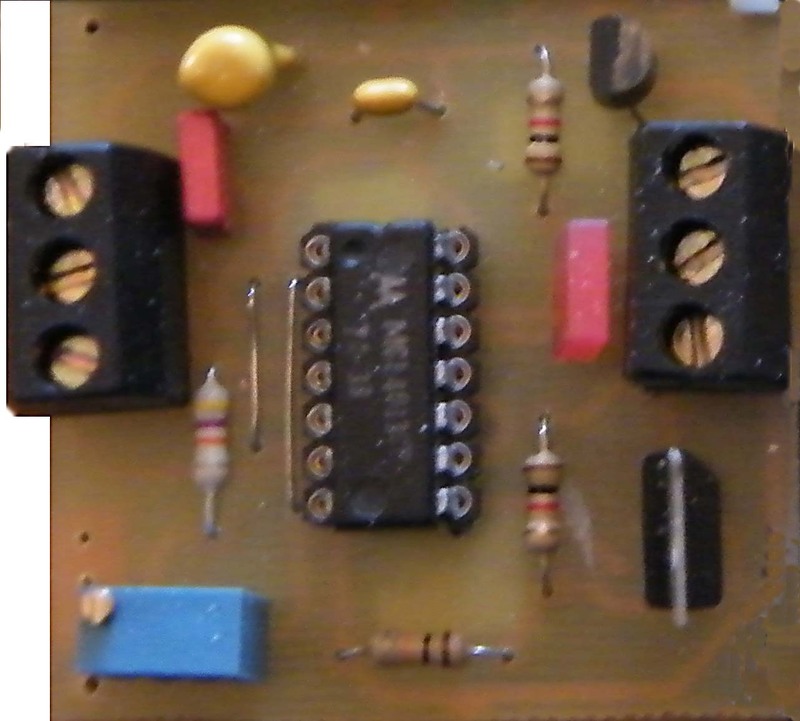 When you have a project that uses a lot of micro controller ports, for example when using a 4X4 keypad you will have lost 8 ports, there is not many port pins left to drive a LCD - normally requiring a further 8 pins other than power and ground. This board uses only 2 lines and power lines, and interfaces to a standard Hitachi 2x16 LCD display. In LED signage applications a need is for a high power driver to drive large lines or PWM RGB or SPI modules. 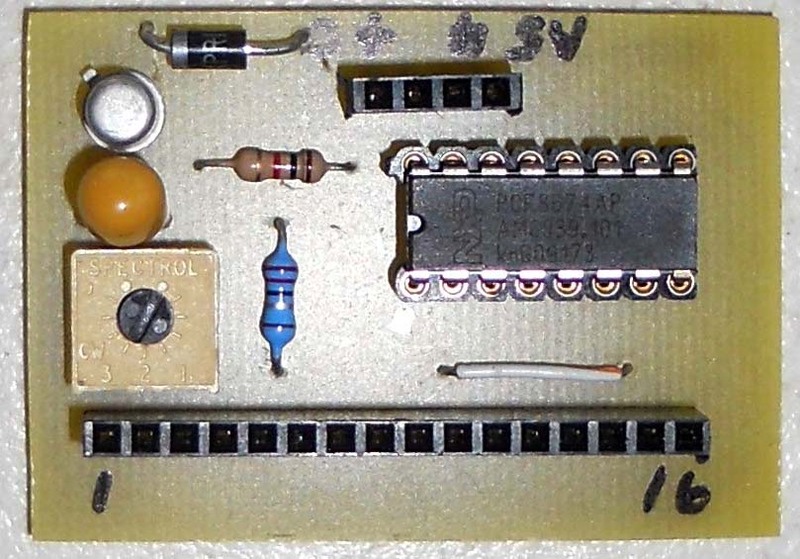 This unit is 5V logic driven so is suitable for being driven from a micro controller port. The amp has 2 channels, so for a RGB installation you would require 2 of them. 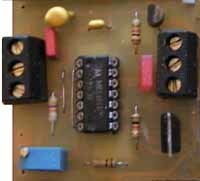 If the output is 5V each channel can drive up to 2A or 4A if only 1 channel is used. For a 12V supply these currents will be halved. 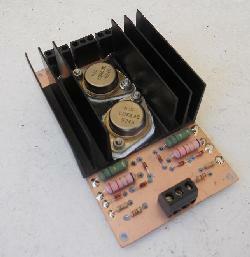 (The heat sink is designed for 20W but with fan cooling each amp can drive up to 8A). We also provide a 10A, 10 channel flasher unit and driver amp where you might want to flash alternate sections of a LED animated sign or display. The bat phone allows you to listen to bat sounds which are above our hearing range. 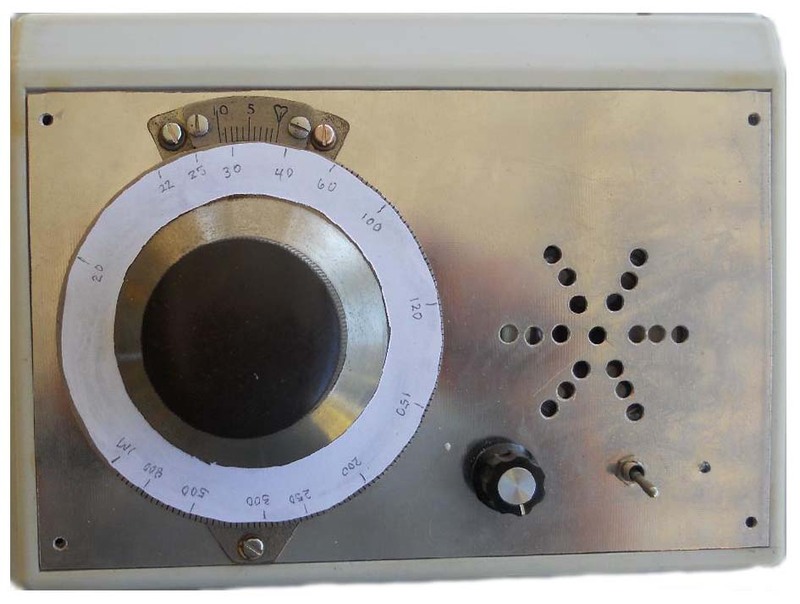 It is tunable from 20kHz to 150kHz and is a full heterodyne type receiver. To do accelerated aging tests on LED's or semiconductors you require an accurate oven to keep temperatures within 1 degree. 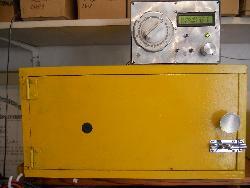 This oven does that, it has a LM35 sensor feeding an Arduino controller with a cut-off timer. Inside the oven is a circulating fan. The temperature can be set between 20 and 100°C (any hotter and the polystyrene insulation will deform). The heating element is simply a standard 60W globe and the response loop time is pretty fast. It gets to 100°C from 20°C within a minute. 10 Channel Sealed Lead Acid (SLA) battery charger for the Cape Gliding Club. Each bank provides intelligent 2 rate charging for a 10Ah battery, and switches automatically to a standby trickle when the battery on that channel is charged, and can then be left on trickle charge indefinitely. Current limit, short circuit protection and reverse charging protection are included. A 4 digit code that operates a strike-lock and actually opens the gate, no need for kids to carry keys to school. The unit is controlled by an Arduino and each code can be set and changed by the user as often as required - eg on dismissing a gardener etc. Developed for Shoprite Checkers, it is a gated flasher for supermarket till display units. The requirement was to light the LEDs above the assistant and then flash and beep for a supervisor's attention when a button is pressed. 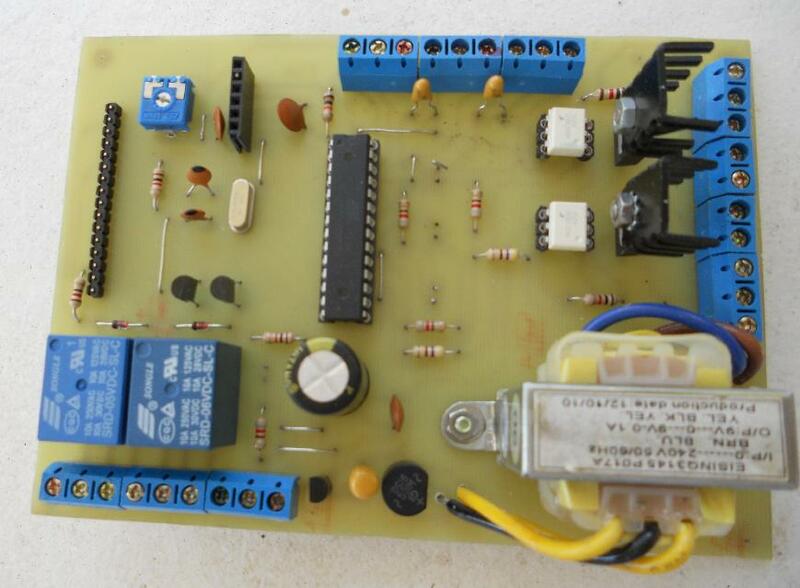 It can be gated with a switch or 5V logic signal. The speed is adjustable and there is a driver for a 100dB beeper. The input is 12V and the LED load can be up to 15W. 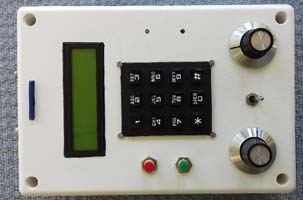 The RC (Radio control) switch is a unit that can be connected to a radio control remote receiver servo output, to provide simple on/off switching eg for landing lights or small motors. 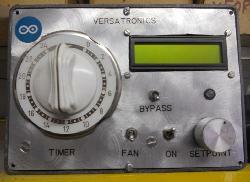 The unit includes a 5V regulator so it can be driven from 5 to 15v. 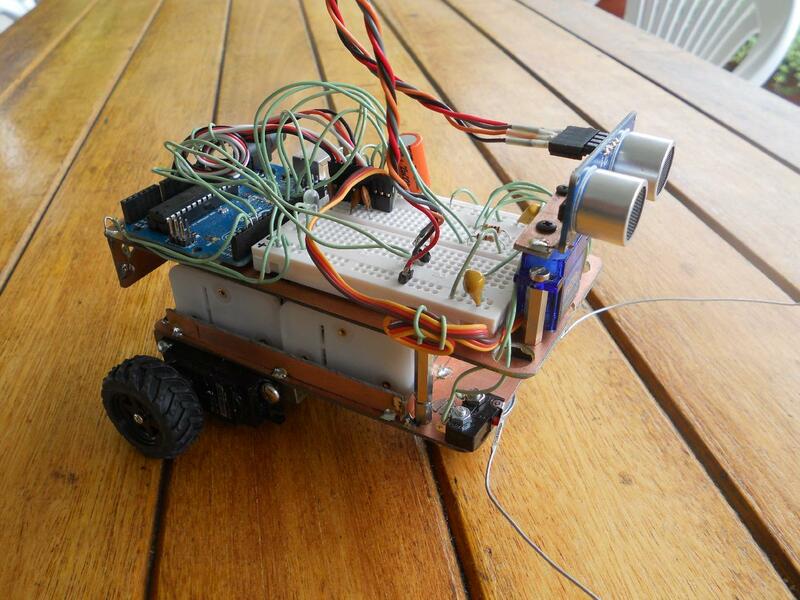 We design and build Arduino based robots for any desired need. This robot is a self thinking (autonomous) person who navigates himself around obstacles using ultrasonic echo location and some clever artificial intelligence. Click here to go to the TID Amp This is a high quality, precision audio hi-fi amplifier designed to minimize THD. 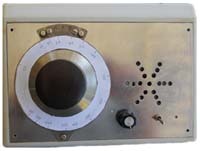 As most naive hi-fi buyers compare harmonic distortion specs between amplifiers and influence their choice on little else, manufacturers compete by using large amounts of negative feedback to reduce their total harmonic distortion (THD) to low levels, while, sacrificing transient response. The ear can not hear harmonic distortion below about 5%. Even excellent loudspeakers produce 1 to 5% THD at low frequencies! TID is seldom specified in commercial hi-fi amplifiers, as it is difficult to measure. Some designers now hold the view that in current amplifier designs, harmonic and inter modulation distortion levels are so low that transient effects are the main cause of audible differences between designs.